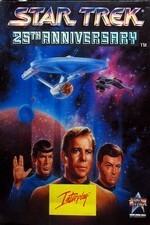 Buy or Rent Star Trek 25th Anniversary Special (1991) Movie DVD & BluRay Online! Movie Plot: A tribute to Star Trek on its 25th anniversary. This film tells the story of how the series (original and Next Generation) and the first six movies came about. Includes plenty of behind-the-scenes looks, clips from the series and movies, bloopers, and interviews with creator Gene Roddenberry, cast members, and NASA officials.